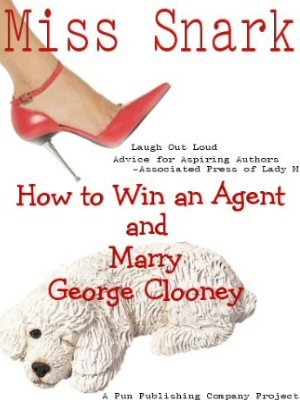 Miss Snark, the literary agent: Does anyone make money around here? Your post about earning through your advance, prompts some questions. Just because an author doesn't earn through his or her advance, does it mean the publisher isn't making money on the book--or at least breaking even? The publisher is getting its own cut of the revenue. Isn't it possible that that it may see a break-even point that covers all its expenses--including the author's advance--before the author earns through? And could that mean publishig a second book for the author even if the advance wasn't earned through? Frequently publishers use this calculation and then give you half up front. If they think you'll earn $2000, they'll give you $1000 up front. This is particularly true of small publishers and is called hedging your bets. The number you want to look at there is the 20%. That means 80% of the pie is yet to be divvied up. Remember, booksellers generally pay at least 40% off list and frequently higher discounts are given to the big retailers like Costco and WalMart (you can buy books at Costco for less than the local indie store has to pay... an ongoing source of friction). That leaves 40% (20% to author plus 40% to bookseller = 60%) for the publisher. Yes it's entirely possible a publisher can cover their costs before the author earns through. The thing about publishing to remember though is that there is more profit in one book that sells 50,000 copies than in five books that sell 10,000 copies. Why? Preproduction costs. That one 50K book required an editor, a designer, an artist and the other folks that add value to the manuscript before it goes out in the world dressed in its Sunday go to meeting dust jacket and binding. There's a certain amount of their salaries, and other fixed costs like heat lights water and gin, that are part of the cost. Let's say a publisher needs to sell 10,000 copies to earn the cost of making the book ready for the store. Once that book sells 10K everything else is gravy (I'm simplifying for demonstration purposes all you economists out there). So, if a book sells 50,000 copies the costs are already paid and the publisher gets more profit. The five books at 10K each have only broken even at that point. You can see why the midlist suffers now, right? And why publishers LOVE the books they think will fly out of the stores in vast numbers? Why celebrity books with name recogniton are easier to place? Publishers would rather take a flyer on a celebrity book they think will sell really well, or perhaps on a new author they think they can turn into this season’s hottie, than publish someone they KNOW will sell 20,000 books. Even if you earn back your cost, and earn through your advance, you’re still not out of the woods. This is the reason people who sell “not enough” are finding it hard to get published on their second, third or fourth novels. One of the reasons I keep yelling about returns and the broken end of the publishing biz is cause 25% of the cost of a new book is eaten up by returns. Think of how many more smaller books could be published if that column on the ledger was reduced in size. I had a fantasy the other day. I wonder if there's room for a new kind of publisher: the "midlist" publisher. A more streamlined (ie, much smaller) operation with fewer editors, art/publicity types, and therefore way lower overhead. Given that that $20 book probably cost $2-3 (or less; and I HAVE done my homework) to print, there's still plenty of money to be made with a "slow-and-steady" model as opposed to the "lottery ticket" model currently in use. Seems to me it would probably be easier to publish 100 titles that each made $10,000 profit than all the machinations that go into trying to find that one title that's going to make $1,000,000. As I said: a fantasy. I saw an article in the Guardian about this the other day. According to them, of a £10 cover price, manufacturing costs are £1.50, author royalties are £0.80, distribution/marketing £0.80, the retailer gets £5.50, publisher overheads are £0.90 and the publisher net profit is £0.50. Which is quite scary. That's in Britain, though - would America (or elsewhere) differ much? You double posted this post. Do I hear an echo? Do I hear an echo? oh geeze, what a mess. this is what happens when I'm not paying attention to the cut and paste out of my word processing program! thanks for the heads up heads up! If returns were scrapped, wouldn't retailers be far more reluctant to have books on their shelves which might not be bestsellers, or from unproven new authors? Need something good to read? Dear Mr Sulzberger: I need an agent. Is Anyone Else Reading This?